[00:00:24] Patrick O’Keefe: Hello and welcome to Community Signal. Thank you for joining me today. Our guest is Michael Wood-Lewis, co-founder and CEO of Front Porch Forum, an incredibly influential community in the state of Vermont that has an interesting model and approach that represents a stark contrast from massive social networks. Thank you to Jules Standen, Carol Benovic-Bradley, and Rachel Medanic for being among our Patreon supporters. If you’d like to join them, please visit communitysignal.com/innercircle. Michael Wood-Lewis and his wife Valerie Wood Lewis, founded frontporchforum.com in 2006, driven to help neighbors connect and build a community. More than half of their state participates daily. Born and raised in Indiana, Michael graduated from the University of Illinois with a master’s in engineering, and an MBA. He and Valerie met while working in Washington DC, married and have been raising a family in Vermont for the past 20 years. 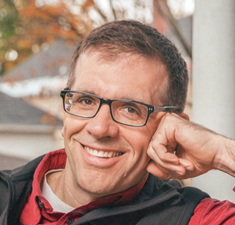 When not working on Front Porch Forum, you can find Michael hanging out in their Five Sisters neighborhood, coaching youth sports or enjoying Lake Champlain and the Green Mountains. [00:01:25] Michael Wood-Lewis: Thank you, Patrick. Hello, how are you? [00:01:26] Patrick O’Keefe: Doing Great. In the bio I just read, you say more than half of your state, the state of Vermont participates daily. That’s amazing, it’s such an interesting statistic, not a statistic a lot of people can claim, unless I suppose you’re in China and you have the Great Firewall of China, and the government makes you go to the same social network. In your case people choose to go there. How do you measure that? [00:01:50] Michael Wood-Lewis: Well, good question, not precisely. I will start with, I’m an engineer by background and so I am sensitive to numbers. Our scale is such that I feel very comfortable making a claim at this point. We have 160,000 members in our state of Vermont, and that’s where our focus is in this one state, and the state has 260,000 households. [00:02:14] Patrick O’Keefe: [laughs]That’s a pretty interesting percentage of market share. You bring up the size of the state, locality, it’s a big theme obviously you’re available throughout the state of Vermont and a few other communities outside of the state. In our pre-show chat, you mentioned that big tech is emptying localities of economic wealth, vitality, people’s involvement, small businesses and more. Front Porch Forum works in the opposite direction, how do you mean? [00:02:41] Michael Wood-Lewis: Well, I’ll give you an example. In Vermont, a person who needs a ride to the airport, can go on Uber or Lyft, and get a stranger to give them a ride to the airport, have a very efficient exchange, don’t even need to pull out your wallet, payment’s handled through the app. Uber and Lyft take a cut of that transaction out of the local community and send it flying right over to the shareholders or future shareholders of Uber and Lyft as they’re looking at IPOs. Similarly, if my in-laws are visiting and they need a place to stay, I can go on Airbnb and again find someplace through that app and probably strangers I won’t know or meet again could provide the housing. Instance after instance, Yelp for restaurants, and Angie’s List for a plumber recommendation on and on. Craigslist to get rid of a couch or selling a used car. Well, all these things occur through Front Porch Forum as well, oftentimes more effectively, seldomly more efficiently, but if I want to ride to the airport I put it on my neighborhood forum and I might hear from five or 10 people about might be, “Hey, good luck finding it I didn’t have a lot”, The next one might be, “I can take you but what time?” The next one, “I don’t know you but how about this?” All these interactions start happening. Selling your car, getting a plumber recommendation, giving away your couch, finding your lost dog, all these kind of things that can happen on dedicated apps created often by these big tech Silicon Valley firms that then have you interact with an algorithm or interact with a stranger once. What we do with Front Porch Forum instead, is have you interact with your neighborhood. All those little connections between you and the five people, 10 people with plumber recommendations who live within a few blocks or if you’re in the country setting may be a few miles of your house builds social capital. What we’re really after is a connection among neighbors, and to build more vital community. Rather than trying to gen up artificial activities like block parties or whatever, we say, “Let’s go back to the throwback thing. In the old days, if you needed a plumber recommendation you asked your neighbors, actually went next door. Now, you go on some app and interact with the crowd. With Front Porch Forum it’s kind of going back to your neighbors but through a digital interface but through those many exchanges over months of living in a community, years, people get to know their neighbors better. They get better connected and the web of community within the local setting grows much stronger. [00:05:26] Patrick O’Keefe: I don’t want to take a cynical look at this, I don’t want to be cynical but it’s a good time to have that value prop. In my view, my opinion every day, every week, every month, there is something that happens with regard to one of the mainstream primary social networks that we’ve come to rely upon for any number of things. Facebook, Twitter, Instagram, Nextdoor, so on and so forth. Something happens, some scandal, some issue especially Facebook, especially Twitter. When that happens it’s a good time for your case. It’s a good time for the use case of something like Front Porch Forum. [00:06:00] Michael Wood-Lewis: It is interesting. Big tech has been following the same script for a long time and the problems have been there persistently. It’s just now they’re getting more attention and people are more open to hearing about it. I know people who’ve been talking about these kinds of issues for years but in the past, they were seen as crazy or it’s just not listened to or not understood. What, what are you saying? It reminds me of “Eat local.” Eat local is a concept that’s been around for a long time. Eating food that’s produced close to where you are and there’s all sorts of health and environmental, and economic development type benefits to that. In the past, people didn’t understand at all that concept of eat local or shop local. Now, it’s very popular in many parts of the country at least it’s understood. I think the same thing that’s going on now at big tech, is people look at big tech and they say, “Yes, I have reservations.” You’re still dependent on it, still using it but I’m starting to get a little wiser about the whole thing. [00:07:06] Patrick O’Keefe: There is this argument that you will hear from any number of these sites. That they help local businesses and that they augment them, create more business for them, make it easier for the customers to engage, whatever it is. There was a time, once upon a time where the only sort of go-between you might have between yourself and your customer when I was growing up might have been the credit card processor? If you took credit cards as a local business that would be sort of the one kind of cut you would give out in your business would be the payment processing charge to the credit card of the merchant provider, so that you could take credit cards at a restaurant in that use case. Now there are multiple organizations who might take that cut or might take a cut of something. You’re on Facebook, Facebook will take a cut. Even if it’s not from you, they’ll take it from the user through advertising, through making you pay to reach them. Same for any number of these services where you drive customers to them, a lot of businesses happily send customers to these platforms. It’s good, it’s bad, there are pros and cons but there’s a cut being taken out of all of that. In each relationship, there’s a tiny cut being taken out of it. It sounds like to me that when I listen to you speak, the really negative that you are espousing is the idea that you’re giving them too much, there’s too much being taken away from you and you’re becoming reliant on them to the point where they drain resources out of local community and get so powerful over that community that again, they can use that any number of ways, nefarious or just stupid. In the case of like a data breach or some sort of security breach or something like that. Am I following the argument in a good way? [00:08:38] Michael Wood-Lewis: Patrick, you make interesting points. I would suggest I think a complementary viewpoint which is businesses, a couple of small businesses, local businesses a couple of generations ago, it wasn’t just the credit card processor they’re paying a cut to. It was the local newspaper. It was a local Yellow Pages. It was other providers of services that made the business tick. Now, a lot of these small businesses don’t have those options and so their advertising budget is going to Google and Facebook and there are other fees for supplies and things are going to Amazon, instead of local office supply, a shop or what have you. What you have is this wholesale consolidation of in some cases thousands and thousands of small businesses spread across the country into one business, into two huge big tech businesses. Uber and Lyft are classic examples, is thousands and thousands of independent taxi drivers and yellow cab type companies are forced out of business. You’re replacing this huge array of owners with local ties in each community with two owners, massive owners based where they’re headquartered. That’s the troubling thing to me because a vibrant local community part of it in a functional local government, you need engaged citizens, you need a vibrant local business sector if you want to have a healthy community and it’s hard to do that in the age of Amazon and Facebook. [00:10:12] Patrick O’Keefe: Front Porch Forum is definitely a local community, but you’re no stranger to mainstream meaningful press coverage. I looked at your press page before the show and I might be reading it wrong and it might just be cherry picking, but it seemed to me like your press mentions come in waves. You have a batch of mentions at this time, one picks you up and you get some more coverage. Like how you’re on this podcast, our little tiny outlet. I happen to see the article in the Verge and actually, a listener mentioned it to me. Serena Snoad noticed and said, “Hey, you should totally invite him on the show, I’d love to hear that conversation.” That’s really part of the genesis of this episode is my own listener in our own local community sense I suppose. Your press mentions seem to come in waves. and so right now, you had that big article published by the Verge, just got back from speaking at SXSW, which is a massive tech festival in an event. What do you think is driving this current non-Vermont interests in Front Porch Forum? [00:11:03] Michael Wood-Lewis: Who knows? Our focus is Vermont, but we’ve been going at this, we launched our initial effort in 2000 just in my own neighborhood. We’ve been hosting online neighborhood conversations for 20 years. We’ve been at it for a long time. In 2006 we formed our business, we started spreading across our small states and now we serve every community in the state of Vermont. We keep trying to innovate, offer more features, more ways to build community in each location here in Vermont as time goes on. Sometimes folks outside of Vermont take an interest in that. Certainly, the narrative we’re mentioned in a New Republic article not so long ago called Escape from Facebookistan, that argues that Facebook has its own nation and how can you get out? Front Porch Forum as well as other projects that don’t follow the venture capital backed, Silicon Valley addiction and surveillance business model that Facebook and so many others have, we’re talked about and since then others started picking up on that thread and the more the curtain gets peeled back on big tech and people start peering behind it and saying, “Oh, this isn’t what I thought it was,” the more they start to wonder about alternatives. [00:12:23] Patrick O’Keefe: Yes, I think that makes a ton of sense to me. When I thought about that there’s this pendulum swing that I’ve talking about on this show and we talk about it in community because they’re all waves for what I call hosted community. Some might say niche communities, focus communities, whatever, where there’s a swing away from those, to sort of bigger mainstream platforms then people become sick and tired of the fatiguing aspects of those platforms. I’m on Facebook, my day job has me on Facebook. I’ve been critical of Facebook as a platform for community, very critical. I think about times when I would leave Facebook possibly when my job no longer required me to be there. They’re back and contributing after just, and they weren’t banned, they just left. It’s interesting when in your case, and I’m sure you’ve probably seen some people come back too. When you run a community for 20 years, you have the beautiful vantage point of this long term perspective and people gravitate away and then they realize that they liked what they had. [00:13:57] Michael Wood-Lewis: Yes, that’s fascinating. I think it’s just oftentimes what comes to mind is authenticity. People are looking for something real, a real connection. People who are really interested in engaging and so much of Twitter and everything else can just be a snark fest that it can be appealing on at one level to many folks. I had my moments when somebody putting a dig in against something I think needs to be cut down to size. I smile and laugh and give it a thumbs up or whatever, but that rings pretty hollow after a while and some people hit the wall on that quickly and others it takes some time before they’re interested in something more meaningful. [00:14:43] Patrick O’Keefe: In the first piece, one of the things that I really liked as you were talking about your philosophy is this idea of slowing down contributions and the pace of the posting or the speed to which you can just have your words up on a site. You mentioned in that piece, how it can make people be more thoughtful. I love to hear a little bit about your thought process behind that when you make a post on Front Porch Forum, how quickly will it go up? [00:15:09] Michael Wood-Lewis: Front Porch Forum is mostly a daily cycle. People submit postings whenever they’re inclined and we have online community managers who review each posting. Then once a day the postings in a given neighborhood, given small town, are gathered up and put out and published in an email newsletter and on our website in our forthcoming mobile app, accessible only to the few hundred people who live in that given neighborhood or small town. It’s once a day. You submit and then it’s reviewed and then once a day people see the collection of postings and there’s the car for sale and there’s the argument about school budget and there’s former recommendations and there’s a funny story somebody heard and it was just quite an interesting collection of things. You read it, just spend five or 10 minutes and most commonly you set it aside and move on. Then over the next 24 hours, as you bump into people in your community, you have a starting point for an actual, this is radical I know, face-to-face conversation as you say to the guy at the bus stop, “I just heard they’re going to move this bus stop one block down, isn’t that nuts?” “Where’d you hear that?” “Front Porch–” “Oh, I saw that same thing.” That’s Front Porch Forum starts and catalyzes conversations among neighbors, real-life conversations. Just the tip of the iceberg happens. The starting point happens digitally and it takes off from there. [00:16:47] Patrick O’Keefe: That’s a choice, right? That’s a choice you made. I’m sure you’ve thought about a quicker resolution to posting. I’m sure you even thought about it and thought about, I’m not saying you want to do it. The idea of letting people post live or certain things go up right away. That’s a choice to have that cycle and I’m sure people have asked many times, this is question, you probably answered it a thousand times. Why haven’t you, what is the holdout? What is the big benefit in your eyes to having that sort of cycle? [00:17:12] Michael Wood-Lewis: Well, I turned that on his head. What’s the benefit of rushing? On more than one occasion, I have seen a topic heat up in the neighborhood where I live on Front Porch Forum and at the same time heat up on Facebook or Twitter. I have to tell you, the tone of those different venues is radically different. On Facebook or Twitter it’s instantaneous, it’s back and forth. There’s ping, ping, ping, ping. Oftentimes, it reminds me of being in high school and being in or out of a clique and people that Sally, she said that because blah, blah blah. I’m not saying that’s what happens all the time on these other platforms, but there’s something that doesn’t encourage our best selves oftentimes in this rapid exchange environment. You think you know who you’re talking to but you don’t really. Front Porch Forum, it’s your neighborhood. It’s more like writing a letter to the editor or something, he’s going to go out, think about it. You can see it later that day, your neighbors are going to see it. At some point you’re going to talk about it, I think about it and then tomorrow is going to be another patch. It’s just a very different pace. We tend to deal in paragraphs and not in snippets. [00:18:26] Patrick O’Keefe: I love it, I think it’s a great way to say it that you’re encouraging your best selves. I actually would go so far as to say I think it’s a design choice on Facebook and Twitter to not encourage your best selves, but I love it. Another thing that probably factors into this that you do that is pretty unique even in a locally focused community is that when a member posts their street name but not their house or apartment number or reveal to their nearby neighbors. Again, the posts as you explained earlier, accessible to people in your neighborhood, but they could see the street name, that area where they live. What’s the impact of that choice? [00:18:58] Michael Wood-Lewis: We did a lot of experimenting early on with what was included in the way of identity with each posting. Initially, we required nothing. We left it up to each person and that didn’t work so well. Actually, it was just confusing. It’s hard to know who was talking. Then we just said, well, let’s just be informed of what will add first names and we thought that would be helpful. That actually made the sense of community works because now everyone because It felt cliquey because people would start referring to Bart or something or like, I don’t know who Bart is, everyone else seems to know who Bart is. I’m the only one who doesn’t know and so people started feeling like they must be not in the in-group like, okay, we need full names and full everything. Then we went and we put every little bit of detail in and that was too revealing and the postings dried up. People weren’t willing to have a 12th degree right out there. We found a balance and the balance that’s working for us as your full name goes on your posting along with your street name and in that way it’s pretty much like wearing a nametag on a block party and somebody says, “Well, where do you live?” You say, “Oh, right there.” You point at your building. You’re like, “Okay, well, I’m glad to know you.” You can have a conversation and there’s a level of trust that goes into that. It’s been super effective. It’s a cornerstone of our design. [00:20:17] Patrick O’Keefe: It’s a really interesting choice. There’s a case to be made for many communities to adopt something like that. One thing you mentioned to me before this show was that this requirement is problematic for when your wards are growing subsets of people. Is that changing your approach at all or causing you to review it? [00:20:34] Michael Wood-Lewis: Well, there’s certainly people who have a legitimate claim for not wanting to be identified within the community they live. Some people for nefarious reasons and that’s a tough break. We’re not going to bend our rules so somebody can do something illegal. For others, they’re the victims. We’ve had people trying to escape an abusive ex-spouse that kind of thing and not wanting to have their identity revealed. We’re certainly sensitive to those situations. That’s a difficult fit for our platform which hinges on a certain degree of identity to help foster connection among neighbors. [00:21:12] Patrick O’Keefe: It’s a difficult problem in a community like that or any community where the guidelines or policies that work for say, 90- I don’t know probably 99% of your community over the years might have helped you build something that is valuable, in some small cases, might actually do harm to others. A lot of community guidelines on any online community have the potential to do that in some cases. I think some communities have had to obviously adjust or just forsake it. It’s an interesting problem. I don’t have a point. It’s an issue they need to be thinking about. [00:21:46] Michael Wood-Lewis: Now, a person in the situation I described can sign up for Front Porch Forum and never post and just read and their identity is not revealed to their neighbors. They’re welcome to do that. If they want to post then they can have a friend or something post on their behalf if they really don’t want their identity revealed. There are workarounds. [00:22:07] Patrick O’Keefe: Switching gears a little bit, Donald Trump is a prolific user of Twitter and many have criticized Twitter saying that they have allowed him to do things that they would not allow other users to do. That the fact that they don’t apply their community standards and terms of service to him. On a much smaller scale, Front Porch Forum has custom paid subscriptions for politicians and local government officials so that they can access the forums as a means of connecting with their constituents and their jurisdictions. What is your approach to moderating that content? [00:22:37] Michael Wood-Lewis: It’s no different. We have what we call custom access subscriptions for a public official or an entity that has jurisdiction over multiple neighborhoods on multiple towns because our base model is anybody can join their one and local forum, Front Porch Forum for free. We have many many small towns here in Vermont where it’s one town, one forum. In that case, the school board member signs up the school principal, the superintendent, what have you, signs up for the one forum in their area and that’s free and it’s straightforward. If it’s the city of Burlington, for example, there are 20 neighborhood Front Porch Forums. The mayor, the city councilors, the parks and rec Department, the school district, they sign up for and pay for this custom access subscription but that doesn’t change anything in how we moderate their postings. The one rule that applies across the board, a set of rules is around elections. Initially, we had public officials, early adopters who realized how powerful the platform was to communicate with constituents when it was time to run for re-election. I’m remembering one city councilor, in particular, he said, “Well, this is easy, slam dunk.” He started campaigning on Front Porch Forum and his opponent who was not an elected official did not enjoy the same access. He started complaining, so we had a problem and we wrote some rules out for the future next election to say you can’t do that for the next election and he happened to be a lawyer. He got on and started campaigning for his colleague, it was a two-seat district, who was working for the same party and who was running the same seat and then this colleague campaigned for him on Front Porch Forum. We had to close that loophole. We’ve been closing loopholes for a number of years now to the point where it’s a fairly even playing field for incumbents versus challengers during election season on Front Porch Forum. [00:24:38] Patrick O’Keefe: Is election seasons [chuckles] the most stressful season for you and your moderators? [00:24:43] Michael Wood-Lewis: Like most places, we have two. We have a November cycle when state offices, federal offices are up and that’s not too bad. Then in the spring, we have Town Meeting day where every town lights up with issues. Some are quiet some years and two years later, it’s a pitched battle. Somewhere there’s always tough Town Meeting days in March in Vermont. It typically plays out and is echoed and amplified on Front Porch Forum, but we love it because what’s happened ,as best we can tell, is more citizens have gotten involved with local elections. More have gotten better informed before it’s time to vote. More are participating. More are running for office. That kind of thing. [00:25:31] Patrick O’Keefe: If you apply the guidelines to everyone obviously that means you could find yourself in a scenario where you’d have to cut someone off who’s a politician or a government official. Have you had to do that yet? [00:25:43] Patrick O’Keefe: How often do you get accused of political bias? [00:25:46] Michael Wood-Lewis: Oh, anytime things heat up enough where we have to cut somebody off, they then claim well you’re obviously pro issue X. I don’t know what issue X? [laughs] I don’t live in your town. You’re 50 miles away from me. Then a day goes by and I get accused of being anti-issue X by the other side. That’s usually when we know we’re doing it about right when both sides complain equally. [00:26:13] Patrick O’Keefe: Yes, just going back to that martial arts community, one of the funniest things I had happened years ago was- and it’s happened a few times with different martial arts, but I don’t actually take any martial arts. I just like the idea of the community and had a friend who was a martial artist and that’s when I launched it when I was a teenager. I’ve always been open and honest about that fact. [00:26:29] Michael Wood-Lewis: That’s cool. “Okay. No, I didn’t take karate.” I’ve been told I took Taekwondo as well. I’ve never done any of that stuff. Yes, those are fun times. You start this community out of need, right? I obviously read the Verge piece, read other pieces about Front Porch Forum. You had a need, you wanted something so you created it. Now, you have this thing that is civically important to the state of Vermont. It’s taken on a greater importance. I don’t know if you saw that when you started it. I doubt you did and it just happened because it works so well. How does that change things for you or how does that make you feel? It’s a rough soft question here, but you start something because you need it, now it’s this important thing in the state. You’re trying to manage it. You’re trying to build a good community, but it’s just that tough thing. Is the importance of it in the state, is that something that has added a weird pressure to this original idea that you had? [00:27:32] Michael Wood-Lewis: Our trajectory has been an interesting one. We started Front Porch Forum with essentially an email list and a spreadsheet in our own neighborhood back in 2000. I ran it for six years just as a hobby. I geeked out on a little bit and experimented and tracked things and collected stories and in my own neighborhood of 500 households, it was vibrant and things happened. People met their future husbands and wives and they rallied around the neighbor with cancer and they got somebody elected and they got somebody thrown out of office. All this stuff happened. Houses were sold and people got jobs. In addition to all the little simple stuff of plumber recommendations and borrowing ladders. I watched that in this one neighborhood. When it came time to launch the business in 2006, I just looked at a map and said, “What if there was one of these in every neighborhood in my town, in my city? What if there was one of these in every neighborhood in my county, in my region, in my state?” Just extrapolated it out. I had confidence, but questions about how it would work outside of my neighborhood. People said, “Well, it won’t work in the southern end of town where there’s more low-income folks or work in the rural part of the county. It won’t work on the other part of the states, the other side of the mountain range.” All these different ideas. It’s pretty much worked everywhere across the state, but each one takes on its a personality. We host about 185, I think it is, local forums across Vermont covering every part of the state now. It’s just endlessly fascinating. I have a great group of colleagues. There are 18 of us on our staff who work together every day to make sure things stay on target and stay generally civil and neighborly in-tow and people are participating, the tax is working and the revenues flowing enough to keep the thing moving. It’s been nothing but a terrific adventure really. [00:29:35] Patrick O’Keefe: You really have something that a lot of people say they want, right? Whether or not they want it or not is a different thing, but you have something where it’s organic, it’s grassroots, it’s locally based. You launch in additional cities when the city in a lot of cases wants you to. Where all cases want you to. Either the government there is giving you a grant, people raise money to get it going. Definitely, there’s demand, right? You’re supplying it, you’re going where the people want. You’re not– [laughs] Maybe to speak about Facebook, going to places where people don’t want you and trying to get a foothold. You have this really interesting level of investment and ownership of members. A lot of people say they want that. They don’t like this corporate behemoth that they have no stake in. They want something more locally supported. Again, you launch these cities thanks to the local support and I’ve asked I think a variation of this question and I hate to keep bringing it up but it’s just an interesting dynamic. Do you think in managing people for the last 20 years but as a business 13 years, that- I’m sure you’ll run into it but maybe not a lot of, people who think that, this is ours or we own this or the citizens or the government gave this, therefore, how dare you X? It’s a common problem with community management of all kinds of people pay for something or invest something in is they expect to be allowed to do X. Is it something that weighs much on you? Is it something that comes up from time to time or is it just sort of par for the course that there is always a small percentage of people who maybe play that card but at the end of the day, you’re still going to apply your standards? [00:31:08] Michael Wood-Lewis: It’s actually one of our measures of success when we hear people saying our Front Porch Forum, whether it’s Bennington, or Winooski, or Montpelier, different towns around our state. When folks start arguing on the forum what the rules are. The rules are stated on the site and they were developed by our staff through lots of interaction with our members, but it’s not a democracy. We’re a mission-driven for-profit business. Our rules are very simple. You can join or leave. You can post pretty much anything as long as it’s not a personal attack, nothing illegal, feel the things like that. The classic is someone will post something about politics, about a tough political topic. Right now our state legislature is tackling some bills around abortion and always a hot-button issue. People are engaging about that and then invariably someone will come on and say, wait a minute. There are no politics allowed in Front Porch Form. They say quite definitively on our Front Porch Forum. Other people chime in and say that’s right. I don’t know what they’re quoting or thinking because that’s never been our policies. We’ve learned over time not to speak up. We watch that and we’re just so impressed with people’s ability to go back and forth, realize something that they’ve been taken for granted hadn’t really thought about as most of us do. I don’t think about where my electricity comes from every time I flip the light switch. Most people don’t think about the undergirding of online forums when they’re reading and writing but this sense of ownership seems to come out when people start talking about those issues and I love it. It shows that they’re engaged. [00:33:44] Patrick O’Keefe: That’s great. [00:33:45] Michael Wood-Lewis: One of the things our members support team has learned over time is if somebody comes at us with a lot of emotion- Again, excuse my math orientation as an engineer, but it doesn’t matter if the sign is positive or negative on that emotion. They can be really happy with us are really mad. I’ll take either one of those over no emotion, no caring, no involvement, indifference. Indifference is a killer but if they come at us really angry I say, your job isn’t to get them down to an indifference your job is to flip the sign from negative to positive by hearing them out. They’re upset because they feel ownership and something happened in this place that they like and often love that upset them. Recognize that investment they have and figure out help them out in that direction. [00:34:33] Patrick O’Keefe: I want to close on a theme that we’ve talked about throughout the show and that you mentioned to me before this show, which is sort of the increasing polarization of people online. Front Porch Forum is not immune to it. Maybe not as vulnerable to it because of management over the years and standards that have been consistently enforced but still the internet is changing how people talk to each other. You ascribe it to big tech, the mainstream media and political forces. You have a community where it’s clear to me that you’re proud of the environment that you’ve cultivated, that your members have cultivated. You’re doing your best to protect that and there’s a lot of people in that same boat. Managing karateforums.com. I see some of the same things but there’s a lot of communities that are larger and that aren’t necessarily even about politics or may be consumed by politics or these topics. There’s a battle there to stop them from becoming more hostile to one another, for disrespectful comments to sneak in for people to- for lack of a better term, start hating each over things unrelated to the community or maybe unproductive to the community’s mission. For those people who are sort of wanting to protect their community that they’ve built over the last 10, 15, 20 years and the environment they’ve created, what would you recommend? What’s your advice for weathering the storm? [00:35:52] Michael Wood-Lewis: We have definitely seen an increase in incivility and polarization as it ripples out from the national scene and it stinks. People, as I said before, their best selves you can disagree over school budget productively or you can do it like they do on Fox News and MSNBC and Twitter. What we have worked hard on is to have consistent guidelines that we consistently enforce. The most important thing is we’ve worked hard to create a culture of civility and neighborliness on Front Porch Forum and we own up and apologize when we very occasionally make a misjudgment on something. Ultimately, the most powerful thing is that culture, that tone. If you walk into a sports bar in the last five seconds of a close March Madness game in the hometown of one of the teams, you’re going to expect one crowd. If you walk into a church during a funeral, you’re going to expect a different crowd and you’re going to behave accordingly. You’re not going to rip your shirt off and pour beer over your head at the funeral, hopefully. Depending on how big of a fan you are for Duke or Gonzaga or something. You just might in another setting. The Front Porch Forum, which really work hard to make it feel like a virtual block party. Come on and talk whatever you want to talk about. You can be cool. You can even get a little worked up about something once in a while. One of the biggest step we will take very occasionally, we will step in as moderators to the whole space and say, things have been going on for quite a while in this controversial topic. We’ve noticed it’s gotten circular, the same arguments are being made. We’re going to encourage people to move on and find a different space to talk about this, like maybe an in real life space, like get the town hall and get a facilitator and have a discussion. Go to the City Council meeting, school board meeting, whatever. And very rarely, in tiny numbers we boot people off. If someone proves that they just are born to troll, just can’t, won’t be reasonable and civil, it’s regrettable we tell them, you either follow these simple rules or you’re done. We boot them out. It took me a while to learn that because I really wanted to air on the side of being inclusive of every last person, but there’s a limit. [00:38:29] Patrick O’Keefe: Michael, I’ve really enjoyed this conversation. Thank you so much for making time for us today. [00:38:33] Michael Wood-Lewis: It’s my pleasure, Patrick. Thank you. [00:38:35] Patrick O’Keefe: We’ve been talking with Michael Wood-Lewis co-founder and CEO of Front Porch Forum at frontporchforum.com. In the show notes on our website, you can also find links to a documentary about Front Porch Forum and the Verge story about the community. For the transcript from this episode plus highlights and links that we mentioned, please visit communitysignal.com. Community Signal is produced by Karn Broad and Carol Benovic-Bradley is our editorial lead. Thank you for listening.